Migrants often apply for asylum in countries where they don't speak the language and where conflicting information about the asylum procedures are making the round in the refugee camps. Imagine yourself in this situation: The people of your host country look all the same to you! Who is there to help you, and who gives the final verdict if you can stay or not? What exactly are your rights and obligations during the asylum procedure? Such questions are answered daily by the Swiss Refugee Council who's employees are representing many asylum seekers in Switzerland. To render the procedure for granting the right of asylum more transparent the Council created an information video. The video explains in short the rather complex asylum procedure. The final video is shown on a touchscreen where the viewer can chose his/her language. The story (or information) unwinds at two levels. On the one side the audience can listen to the voice for hard facts. The images support the voice but also communicate to the asylum seekers tacit information (What kind of people will I meet? How should I greet the person I interact with?). Though the video was put into use only in May of this year, first experience is positive. Asylum seekers who watched the information video before their first meeting with their legal representatives were in a position to build on the information in the video. Their first discussions with the legal support service proved to be more to the point. Probably the main challenge was to find an audiovisual language that could be understood by people from different cultures and socioeconomic backgrounds. From the start the decision was taken to show the asylum procedure as it is in reality. No graphical signs, or animations are used in the video. The video presents itself more like a film. 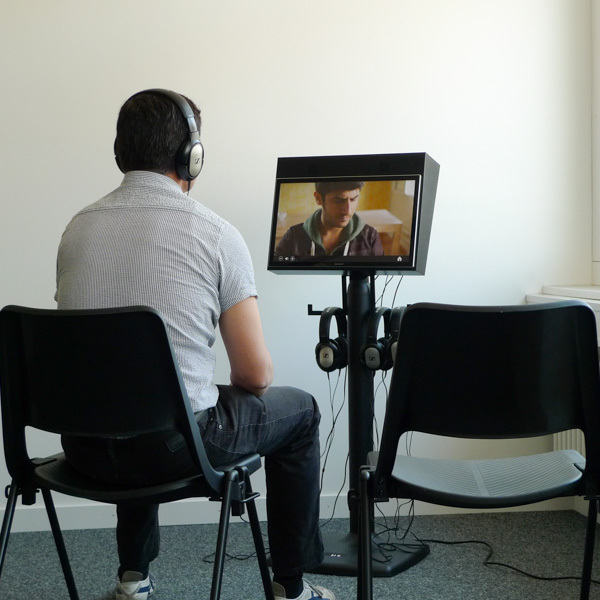 The audience follows the main character as he is registered, interviewed and consulted by the different parties during his asylum application. Besides the images depicting each step of the asylum process the audience listens to a voice providing further details such as the rights and duties of each applicant. So far the voice-over has been translated into 12 languages. In order to control production costs the 12 language versions were synced to one and only video version. This can be tricky when dealing with languages that at times are twice as long as the English text! This post displays stills from the final film. The film itself is not on public display. Thus, the stills on this page don’t show the official personnel that acted in this film.